ST. GEORGE — Looking to liven up the Town Square Park area, city officials are thinking about opening up a food truck park near the St. George Library. The city owns several vacant houses along the northern block of 100 South between 100 West and 200 West, including two aging homes directly adjacent to the St. George Library on 100 West that have been vacant for over a year and are plagued by heavy water damage and mold. 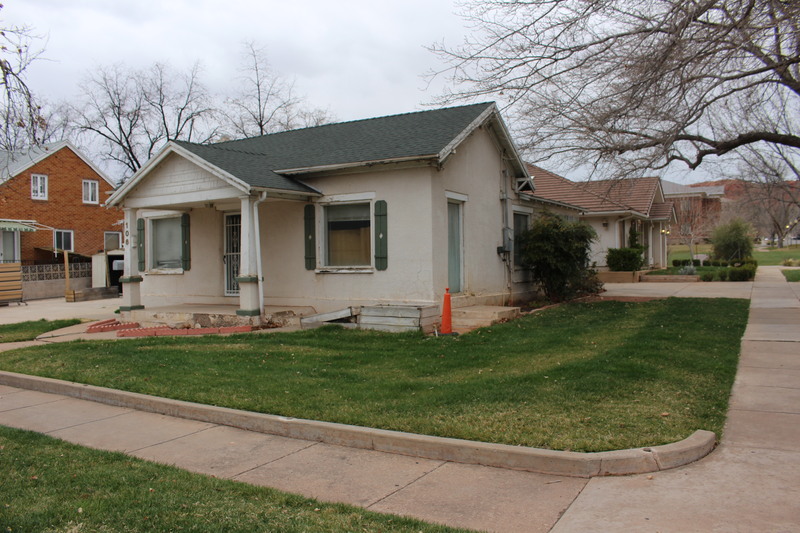 “There’s nothing historic about them – nothing redeemable about them,” St. George Support Services Director Marc Mortensen said of the two houses during a City Council meeting Thursday. City staff and planning personnel have been discussing what could go in place of the homes if they were to be demolished. “One of the things we’ve thrown out there,” Mortensen said, “would be maybe beginning the monetization of Town Square. 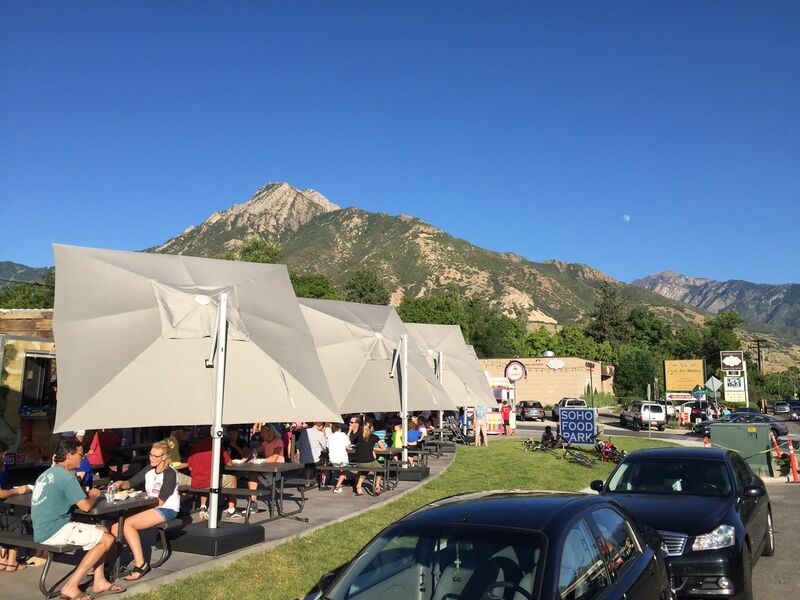 Mortensen cited Soho Food Park in Holladay as a possible model for a similar park in St. George. The picnic table-lined park in Holladay accommodates six food trucks and is a popular destination for area residents. Mayor Jon Pike recently visited the park while on business in Salt Lake City and said it would be a good fit for the St. George lots. Councilwoman Bette Arial also expressed favor for the idea. Before anything can be done with the lots, city officials will need to approve a bid for the demolition costs, which Mortensen said will likely cost $25,000-$30,000. For now, the food truck park is just an idea. It could have promise. Is there an area for customer parking? Do we have enough food trucks to make it viable? At least there won’t be an empty store front if the business moves. Holladay had different trucks there every day/night during the summer. You could go every night of the week and have something different. There’s everything from sushi to waffles to BBQ, even hearty firehouse food or curry. guess i can stop in and get my corn dog on a stick (or go to Costco and just buy a box of them)….the food truck game in town is weak sauce. Great idea. We have some wonderful food trucks here! It might actually become a destination. Build a Marijuana service centerther after you bulldoze the old homes, like the Mesquite “Pot warehouse” and you won’t know what to do with all the endless customers…..then the food trucks can fullfill the munchies…oh hell city council, you live for the back room payola deals $$$…how about it? The city might consider using this area for additional library parking. It’s always difficult, if not impossible, to find a space in the current lot. Yes, also hard to find parking in summer for water feature. Whatever you do, dont house homeless there. Give ’em a bus pass to Hurricane or LaVerkin, where we don’t have to see ’em. You bring up a good point. Eventually the city will have to do SOMEthing about homeless. Might as well be now. Better than having them camp out at the Ft Pierce site. But the Holladay food truck lot is well-attended during summer months. If this place doesn’t become a venue for them, another one should be found. And no, it’s not the cheap corndogs from Costco, it’s actually decent food worth paying more for. I had a lobster roll in Holladay, paid over $20 for a sandwich my wife and I could split. A few weeks later, that company, “Freshie’s” from Park City, won an award for the best lobster roll in America. If you want cheap, go buy a hotdog from the roller grill at 7-11. If you want good, eat at a food truck.